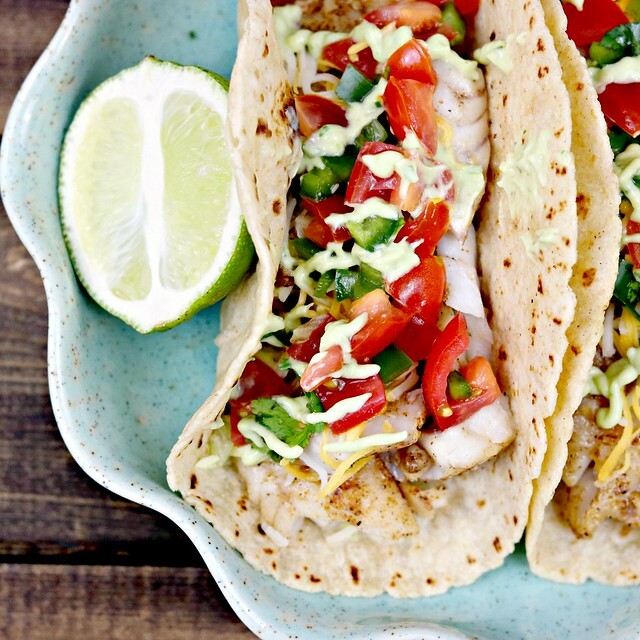 Cajun fish tacos have the perfect balance of creamy and spicy, topped with avocado cilantro sauce and a tomato-jalapeno salsa. 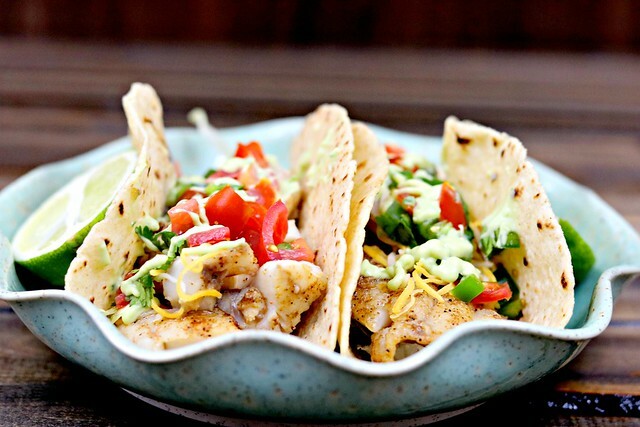 Fish tacos are all the rage these days, it seems. You can find them all over the internet, in all types of restaurants, and in many home kitchens. We love fish. And my outdoorsy husband loves to catch fish, maybe even more than he loves to hunt. I’m not sure, could be a tie between the two. Either way, once hunting season has ended and the weather starts to warm up a little, he’s ready to hit the water. And he gets so excited when he brings home a big haul of fish for me to cook. Of course, much like I have to do with all the venison he brings home, I have to think of ways to cook all the fruits of his labor. This particular haul of fish was White Bass. Which, in no uncertain terms, means it’s pretty versatile, as many white fish are. But anytime he brings home meat, that he has hunted or fished for, I like to really put thought into what I make with it, because he worked hard to get it for us, and I want to show appreciation for it. 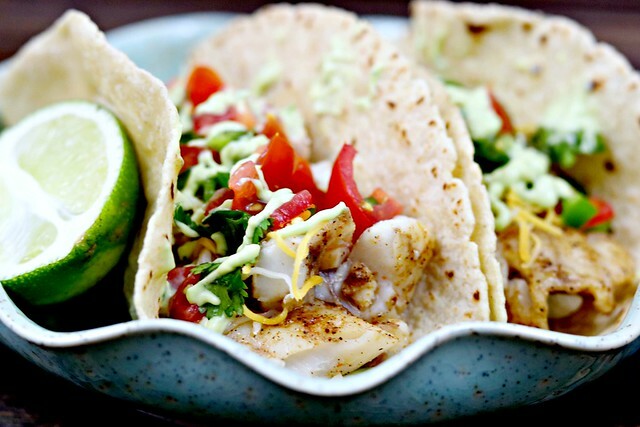 Like so many others, J is a fan of fish tacos, so that’s what I opted to make with his last catch. And boy were they good!! Maybe because they were fresh-caught, instead of store-bought? I think there is definitely something to be said about that. 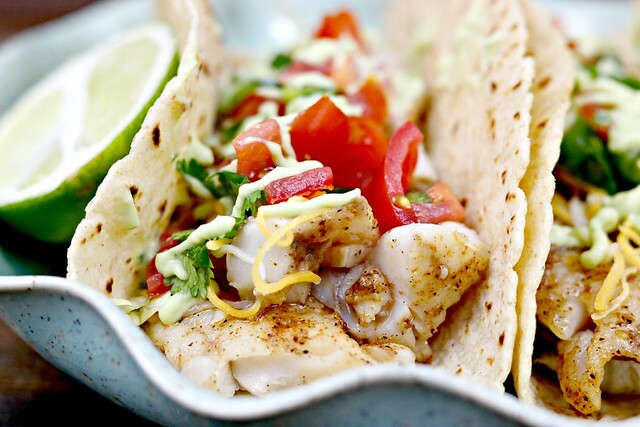 Perfectly seasoned and topped with a creamy avocado cilantro sauce and a tomato and jalapeno salsa makes these the perfect fish tacos. And it doesn’t have to be Tuesday to have a taco night! Although, it is fun to say, Taco Tuesday! Sprinkle both sides of fish with the Cajun seasoning, and set aside. While the seasoning marinates the fish, place avocado through lime juice in a blender of food process and blend until smooth. Season with salt and pepper, to taste, and add more lime juice (or water) if you want to thin it out some, or more Greek yogurt if you want it thicker. Refrigerate until ready to use. In a small bowl, combine the chopped tomatoes, cilantro, jalapeno and lime juice. Season with salt and pepper, and set aside. Heat olive oil in a large skillet over medium-high heat. Add the fish, and cook for 2-3 minutes per side, until nicely seared and flakes easily with a fork. You can either leave the pieces semi-whole, or break up into smaller pieces, whichever you prefer. To assemble, warm tortillas, then top with lettuce, fish, salsa and avocado cilantro sauce. You can add additional cilantro on top as well, if you like!